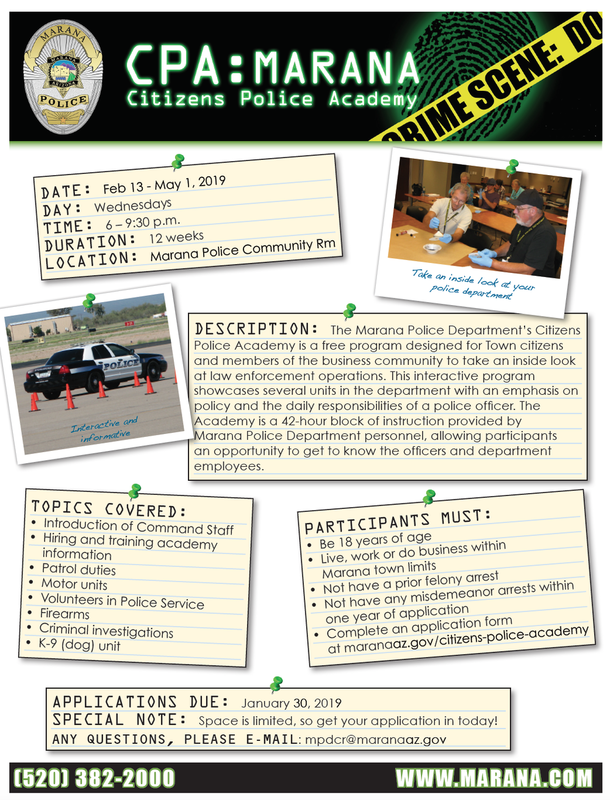 The Marana Police Department is happy to announce their next Citizen’s Police Academy. The Citizen’s Police Academy is designed to provide our citizens and business community with a greater understanding of the department and its operations through classroom instruction and hands-on experiences. This Academy is a 45-hour block of instruction taught by department employees that showcases several units in the department. This academy is held every Wednesday from 6:00 pm to 9:30 pm for 13 weeks. Classes start February 13th and go until May 1st, 2019. For more information, visit our webpage at (http://www.maranaaz.gov/citizens-police-academy). For further questions please contact the Community Resource Unit at 520-382-2051. Seats are limited so sign up today, but no later than January 30th, 2019!! !